Integration between Dynamics CRM and SharePoint has been possible since version 3.0 but involved custom extensions that often proved tricky to maintain. Dynamics CRM 2011 now provides SharePoint integration out of the box. 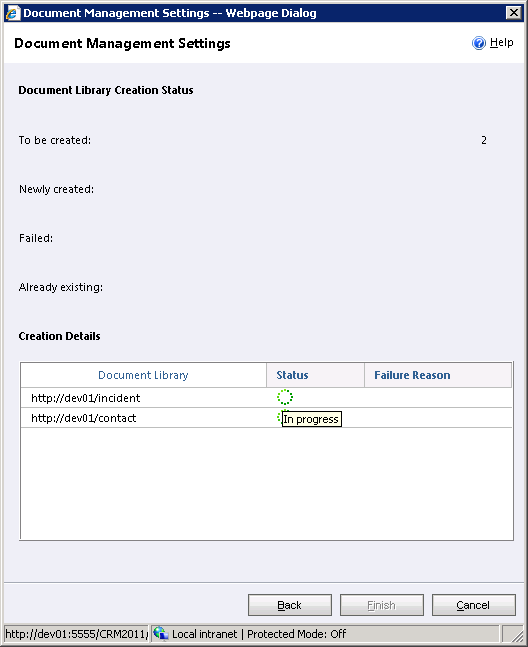 This post provides a summary of this new integration with SharePoint 2010. Essentially the integration allows you to create a folder for each entity type (where document management is enabled), and sub folders to store documents relating to a specific record. Using SharePoint 2010, Dynamics CRM 2011 will automatically create these folders for your having the same name as a particular record. 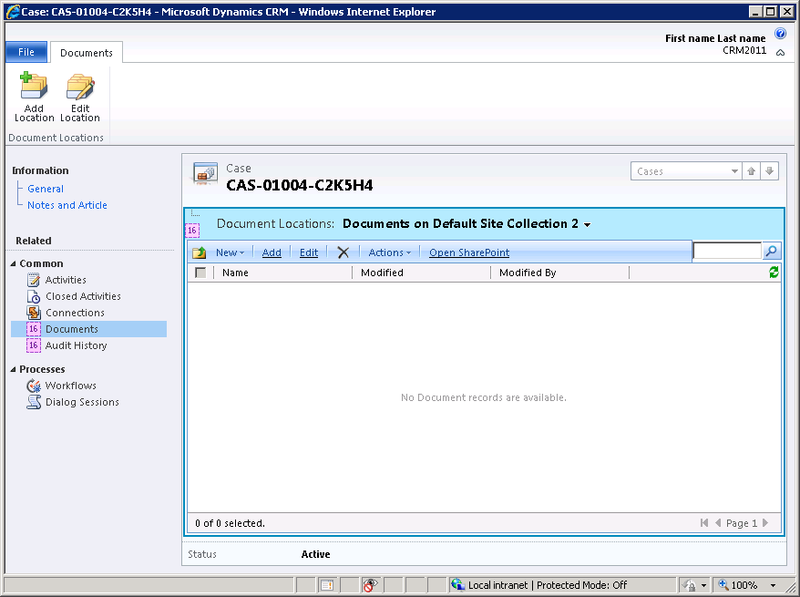 To utilise this automatic folder creation, a SharePoint site is set as the default location, and then for each record folder a 'Document Location' record is automatically created. These Document Locations can also be created manually on a per record basis to point to a folder by a absolute URL in any SharePoint site, or by using a relative URL relating to an existing Document Location. 1) Select System->Document Management->Document Management Settings. 2) In the Document Management Settings Dialogue, select the entities that you wish to enable Document Locations on. 3) Select the Url of the SharePoint site that you want to store documents in by default. Users have the option of adding more locations manually on a per record basis, but this site is the default that will be used. The default site can be changed later if it becomes full or changed if it has moved - if a new default location is created, new document locations will use the new site, but existing document locations will still be linked to the old site. 5) In the next dialogue, the SharePoint site is validated. If you select 'Based on entity' you can select the sub folder to store documents underneath. 6) By Clicking 'Next' you'll see a message box asking you to confirm that you want to create the root document locations for each entity. 7) Clicking Ok, will give you a progress window, where each folder is created in SharePoint. You must have permissions to the given SharePoint site to create folders otherwise the process will fail. 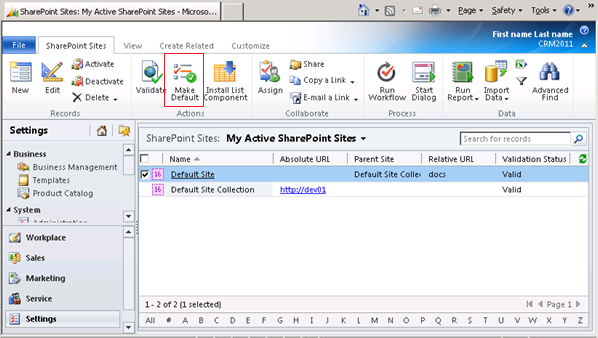 SharePoint Site - Provides a link to a SharePoint site collection or site. Name - The Name of the SharePoint site. This is set automatically to 'Default Site Collection', or 'Default Site'. Relative Url - Text - If the Url Type is Relative, this provides the sub site location. Document Location - Provides a link to a document library and folder for a given record. E.g. If you click on 'Documents' in the navigation bar, a folder is created with the same name as the record. Name - The Name of the Location. By default this is of the structure 'Documents on <Site Name> #' Where # is an incremental counter. This can be renamed once created. Relative Url - The folder name where documents are stored. It cannot be more than one folder, so if you have nested folders, you must create a parent Document Location, and reference it in a sub Document Location. Regarding - Empty for root document folders (contact, account, incident etc), and for specific record folders, the lookup field references the specific record that the document folder is associated with. Essentially this is the same as the 'Regarding' field on activities. Scenario 1 - A contact with 1 case with the 'Based on entity' unchecked. Notice that the parent library/location for the contact and case is set to the root document location that was created by the Document Management Settings wizard. Scenario 2 - A contact with 1 case with the 'Based on entity' is checked. The actual interface to SharePoint is provided by the CrmGrid page that must be installed on the SharePoint server. The installation notes provide good instructions on how to get it installed: http://go.microsoft.com/fwlink/?LinkID=200050. Because the SharePoint integration is an Iframe, the client security context of the current user is used and so you must have access to the SharePoint site to perform operations from within Crm. There is no linkage between CRM and SharePoint Security. You can select from multiple locations associated with the same location using the Document Locations drop down. 1) Since the folder in SharePoint is named using the display name of the record, if you subsequently change the name in CRM (e.g. change the name of the contact, or rename the title of the case) you will receive a 'library not found' error when clicking on the 'Documents' navigation bar item. CRM 2011 then gives you the option to re-associate the record with a new location. This usually would mean renaming the folder in SharePoint and then updating the document location record in CRM. 2) There is no synchronisation between the security roles in CRM and those in SharePoint. For this reason you must secure your SharePoint site manually. If a user attempts to use the automatic folder creation feature, but they don't have access to the SharePoint document library, the operation will fail. 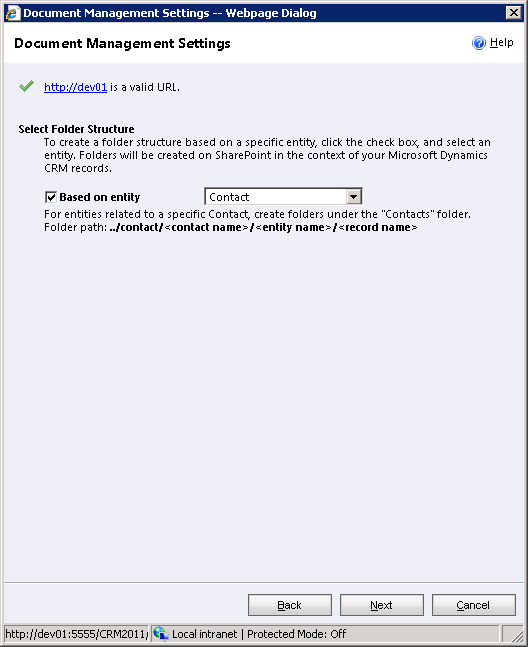 3) Some CRM 4.0 integrations to SharePoint allowed you to create a sub-site per entity record. This would still be possible with the CRM 2011 integration with some coding, since you can create your own document locations and relate them to the given record. 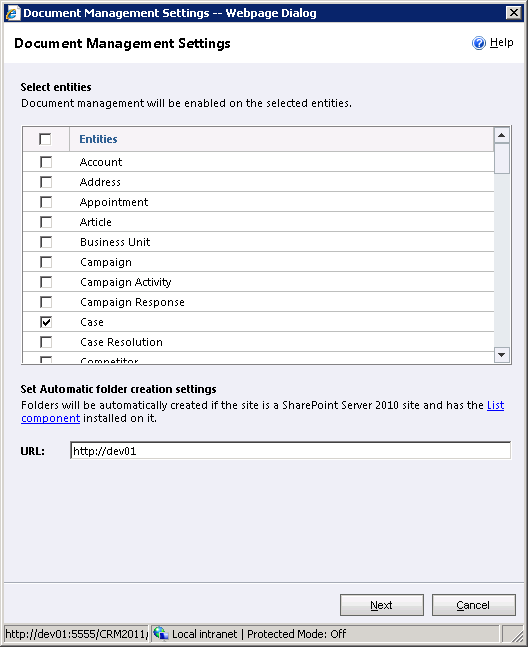 A Plug-in could be created to automatically create a sub-site and create a corresponding SharePoint Site and Document Location when a record is created. Since the default site folder creation only runs if there are no Document Locations for the current record, you would then simply be given the custom document location rather than a default one created. 4) Note attachments and email attachments are still stored in the CRM database, and currently there is no easy way of removing the ability for uses to create attachments in CRM without removing notes all together. Email attachment support is tightly coupled to the CRM database storage of documents, and so this is always going to be needed. A custom plugin could be written to 'harvest' note/email attachments and automatically add them to the associated document location. 5) If you enable Content Types on your document libraries, when you add a document via CRM, since the interface is essentially just SharePoint, you are still promoted to select the Content Type and provide additional metadata. 6) The automatic folder creation functionality is only available when you are connecting to SharePoint 2010, although Document locations will work with SharePoint 2007. The out of the box support for SharePoint in Dynamics CRM2011 does a good job of providing a simple and low maintenance option for users to store and retrieve documents in SharePoint from within Dynamics CRM records. Users can then benefit from SharePoint's searching and document management features. More importantly, it is designed in such a way that it can be extended by Developers to support more complex integration scenarios.